Tips – Keep Your Furniture Looking Fresh! So you just purchased a fabulous piece of furniture and you’ve promised yourself that this time, your new addition will remain looking brand-new for as long as possible. Sometimes being proactive about furniture care is easier said than done. At OmniMount, we want you to enjoy your furniture for years to come, and you can with the addition of our OmniMount Essentials line into your home. 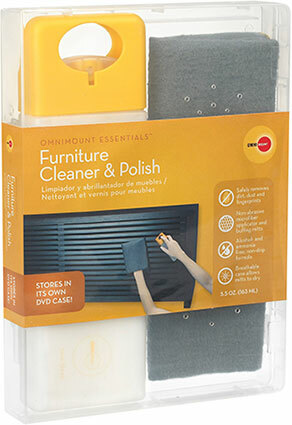 Our furniture cleaner, the OEFC5, was created to make furniture care as easy as 1-2-3. Cleanse your furniture once a week to minimize dust and fingerprints and protect surfaces. Be aware of the material you are working with. If your furniture is made of wood, use a buffing mitt. If you are cleaning more delicate surfaces (stainless steel, glass, etc. ), we suggest opting for a non-abrasive cloth. Be sure to lift and place items on furniture rather than sliding them onto furniture to avoid scratches. Use coasters or some sort of placemat to protect furniture from water rings and permanent damage. Opting for a “multi-purpose” cleaner will save money and storage space. Now, you may be asking yourself, “Why choose the OEFC5 over the leading furniture cleaner?” The answer is simple when you see what the OEFC5 brings to the table. This five-ounce multi-purpose cleaner offers a convenient and affordable way to take care of your furniture and is the perfect companion for your wood and stainless steel furniture. Safely removes dirt, dust and fingerprints. Non-drip formula is alcohol- and ammonia-free. Includes a buffing mitt perfect for wood furniture and a microfiber cloth for more sensitive surfaces. DVD-sized case is breathable, allowing cloth and mitt to dry and can be discreetly stored with the rest of your media. The OmniMount Essentials line of A/V accessories was created to make sure you have the highest quality solutions for everything from screen cleaners and furniture polish to surge protection and child safety kits. Check out the OEFC5 and the rest of our essentials line here! The TRIA 1 is a 1-shelf wall system that offers hassle-free shelving and cable management for your A/V components. It allows you to neatly organize your components right under your flat panel without creating a tangled mess or running connections through your wall. Instead, your cables are routed behind the cable covers. The Tria 1 is easy to install, but here is a little tip for routing all those wires. Step 1: Place your components on the shelf. Step 2: Route your cables and secure them. Step 3: Slide the covers down the spine of Tria 1 and attach them. Step 4: Attach the top and bottom covers. You have now completed the Cable Management process! This tip is just another way that OmniMount is making flat panel mounting easier for you. 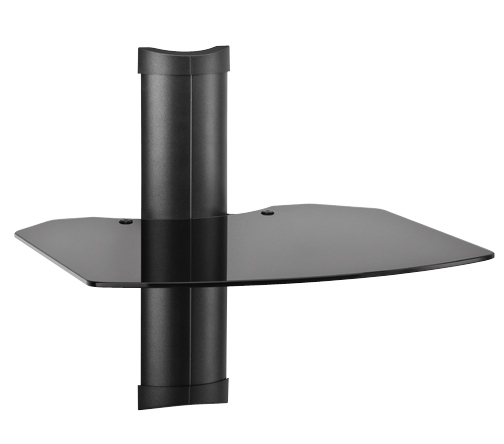 At OmniMount, we realize that choosing a mount for your flat panel TV can be overwhelming. With so many options available, you may find yourself asking, “Which type of mount is right for me?” While choosing the right mount is not difficult, it does require that you consider how and where your flat panel TV will be used. In general, there are four criteria for you to consider: viewing area, viewing height, viewing flexibility/convenience and room lighting. For example, if you will be placing your flat panel TV up high over a fireplace, a fixed mount doesn’t offer a good viewing angle. If you have a window behind your sofa, you should consider a tilt mount to reduce glare. Or, if you have a great room or game room with a wide viewing area, you’re probably going to want a full motion mount – either manual or motorized. In an effort to help you choose which type of mount is best for you, here are some tips. There you have it – a complete guide to picking out the perfect mount for your flat panel!